The long awaited return of the eighth series of The Great British Bake Off, in its new home on Channel 4 and with new presenters and judge Prue Leigh, finally happened last night. Prue and fellow judge Paul Hollywood met a fresh batch of 12 amateur bakers and by the end of the show had cut them down to 11. There first challenge was to make a fruit cake using fresh not dried fruit, which Prue admitted 'was not an easy start'. There were the usual disasters along the way, but challenge three - 'illusion cakes', was the icing on the show, and if you missed it, then I wont spoil the event, but get to catch-up TV quickly! Essex resident Peter, aged 52, was the first baker to get the boot from the competition after his coconut cake contained too much baking powder, his chocolate mini rolls failed to impress and his cake in the shape of a bread and board proved to be too dry and simple for the judges. I must say that the show retained the former BBC format almost exactly. 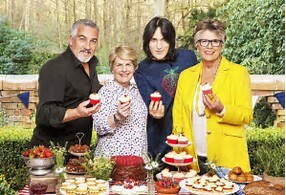 despite the personnel changes, even Prue's fellow 'newbies', presenters Sandi Toksvig and Noel Fielding were rather good, though they can't say 'bake' as well as Mel and Sue. Their 'little and large' sparing will no doubt prove to be a characteristic of the new show that, along with innuendo, will adhere them to their viewers. All in all, it looks like The Great British Bake Off will continue to attract the millions of viewers that it has in the past and will prove a good investment for Channel 4, offering a prime advertising slot. Whether the BBC's new baking shows will steal any of the limelight in the coming months is yet to be seen. ^ 6 million viewers tuned in to The Great British Bake Off last night, less than watched the first programme in the BBC's 2015 and 2016 series.